Most economical cord lanyard for ID display and related application. 2-color twined design (customers can choose the color combination! 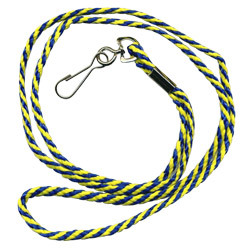 ), now offered at the same price as 1 solid color neck lanyard (#ECL-002). Fitted with Swivel Hook / Bulldog Clip / Split Key Ring as the standard. Other end attachments available upon request. 100% made in Taiwan w/ excellent quality and product safety guarantee. Colors: 2 color combination - customer’s pick! 100% made in Taiwan high quality with product safety guarantee! On sale, offered at the same low price as 1 color cord lanyard (No. ECL-001)!!! Please feel free to contact us for more product details!